The ultimate in technical sophistication in high speed performance from Quadrel. 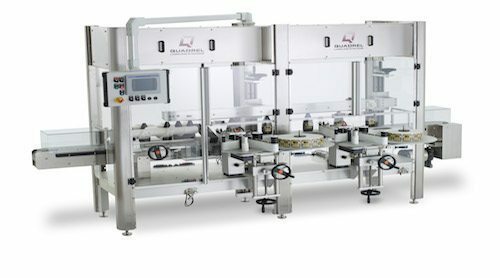 The ProLine is designed for the most demanding 24/7 labeling applications and features all overhead electronics, internationally compliant guarding, Allen-Bradley PLC, (MicroLogix, Compact Logics and Control Logics) Allen-Bradley© Panelview color touchscreen and servo driven label applicators and product handling. All ProLine’s come standard with full Ethernet capabilities. The ProLine is designed for 24/7 operation and to accommodate a wide variety of flat panel, oval or round containers at speeds in access of 300ppm. Standard features include all overhead electronics, internationally compliant guarding, Allen-Bradley© PLC, color touchscreen operator interface and servo driven label applicators and product handling. 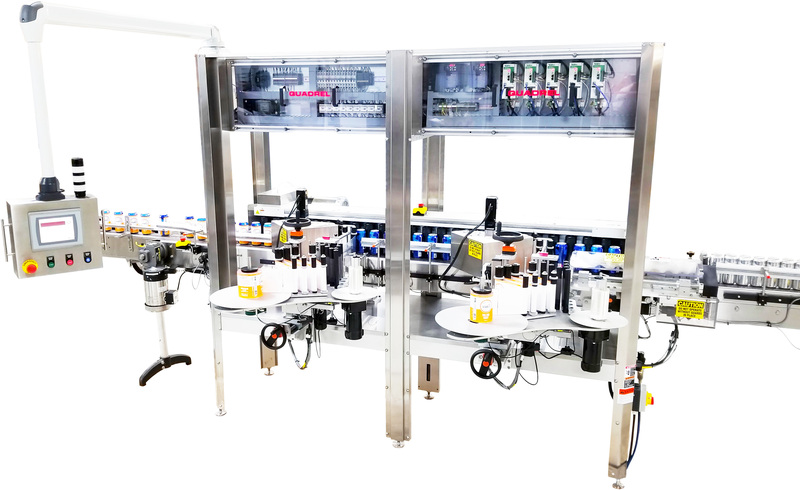 This high speed non-stop zero downtime labeling system features four servo driven applicators designed to accommodate a wide variety of flat panel, oval or round containers at speeds in access of 300ppm. This system features pneumatic slides which reposition the applicators outside of the guarding during roll changes. This pulls the applicator away from the conveyor for ease of label change. system features all overhead electronics, internationally compliant guarding, Allen-Bradley© PLC control, touchscreen operator interface. 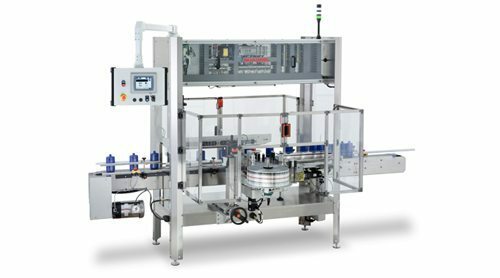 This premium quality high speed non-stop zero downtime labeling system is designed for wrap labeling 24/7 operation at speeds in access of 300ppm. This labeling system features all overhead electronics, internationally compliant guarding, Allen-Bradley© PLC control, touchscreen operator interface.